Modern UI developers invest more time and attention to visual design. Content is naturally the focal point on any webpage, but what draws the attention of the visitor to the content is visuals. Visual design or user interface (UI) design is an important aspect of web design trends. This is why Google’s Material design features are rendered to be more effective in UI designing for implementing visual communication. The usage of shadows, depth effects, icons, buttons and translucent backgrounds is not simply for enhancing the visual appeal of a user interface. These visual elements usually guide and engage visitors, often simplifying the process of information consumption. Icons in web design are considered to be very important. They not only symbolize functions or meanings but also make the overall user experience more interactive. With the advent of modern technology and the growing demand for icons in the design of user interface, icon designers are having a time of their life. You can design icons with a lot of variations by applying effects. People can easily relate with icons as they come across several types of icons in their day-to-day lives, such as traffic signs, weather icons and emoticons. There are a range of online websites from where you can easily buy icon sets. You can also get some icon sets for free. But, sometimes, icon designers feel the need to come up with fresh and new icons as a part of project requirement. Moreover, the joy of designing icons for web is only known to a few creative designers who love web design. Icons are widely used for social media websites, e-commerce sites, gaming sites and more. We are aware of the ‘Like’ icon on Facebook or a ‘Shopping Cart’ icon on an E-commerce website. But, there are actually thousands of icons that fall under various categories. In web development, icons are widely used on featured lists page on website, social media buttons, important sections like contact us page and more. You too can generate new and original icons for websites or mobile applications. Here I am presenting a list of ten websites which offer icon designers the liberty to generate unique icons. So, go ahead and check out this list of 10 websites To Generate Icons. This online tool lets you create beautiful e-mail icons from your e-mail address. The tool generates icons for various e-mail service providers, such as Gmail, Yahoo!, MSN, Hotmail and more. MakeAppicon is a robust icon generation online tool for iOS and Android applications. The tool lets you resize and optimize your icons in to various formats and sizes required for iOS and Android apps. Iconion not only lets you generate your own icons but also allows you to style existing icons in your own way. You can select symbol fonts from Font Awesome, Linecons or any other online source. After uploading its image file (png, bmp, jpeg or ico files), you can manipulate the image using its editing features. If you are fan of personal icons, then Iconize ME is a great online tool that will rock your online world. Personal icons look unique on social media profiles or personal blogging platforms. FavIcon Generator is an ideal online tool for generating your next ‘favorites’ icon for your website from an image. The tool lets you upload an image file and select an output format from various options, such as gif, jpg, png and bmp. Favicon is widely used for branding your company’s logo for online visitors. This tool lets you upload an image in GIF, JPEG or PNG format and convert it in to a Windows favicon (.ico). You can also use this tool for generating icons for websites as well as for iOS, Microsoft and Android applications. This online tool from Android Asset Studio is exclusively dedicated to generating web icons for Android applications. You can generate icons from images, clipart or text. Moreover, Launcher Icon Generator offers many features to choose colors, shapes, background and effects. Pic2Icon is a free icon generator and it offers a ton of features for applying various effects to your icon. Moreover, it offers tools for icon format conversion as well as generating Windows 7/Windows XP icons and iPhone/iPad icons. This online tool lets you create icons from a variety of image file formats. RealWorld Icon Editor offers features to churn out icons from 3D models and paint icons with layers. 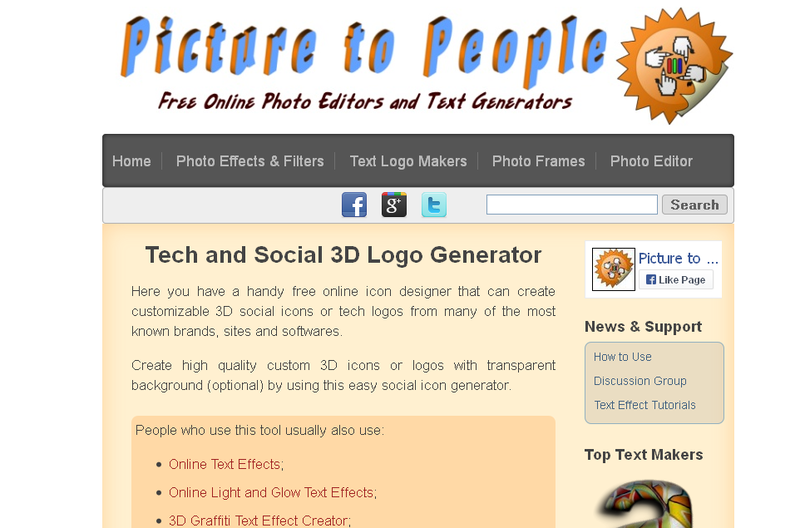 Picture To People is your online destination for generating 3D icons and logos. This tool will let web and mobile app developers to create 3D social icons and logos for popular websites, brands and software products. Some of them include Facebook, LinkedIn, Instagram, YouTube, GitHub, Google and more. Icon generators are an important category of web design tools. Using these online tools, you can generate a variety of icons for categories, such as restaurant, traffic, weather, social media, games, art and more. You can also create your own 3D icon sets which can be used in a variety of contexts. User interface designers and graphic designers require new tools to generate icons while working on the aspect of visual design for a website. You can share information on some more icon designing tools by writing in the comments section below. Thank You.